Politico posted a story about millennials and housing affordability. It is a long, feature length article. Our own Wallingford neighborhood is used as the archetype for this battle playing out nationwide. The main person in the story is a young professional trying to change urban development. The choice of accompanying image was done from convenience as it was the first image I found already uploaded on the Wallyhood site. It does not connote any particular view of the site. The story has a lot to say and can be found here. Let the comments be civil. The title of the story is great, “My Generation Is Never Going to Have That”. Effectively most of the anti-density stances are about preserving a dying lifestyle the future generations will never have. Yes, school teachers probably can afford a house in Wallingford quite some time ago, but today it’d be hard for them to even afford Kent. And the school teachers that bought into Wallingford long time ago are sometimes the ones that’s trying damn hard to ensure new school teachers can’t afford to move in. Actually for me it’s much more frustrating for people to keep pretending there are win-win solutions. The ideas you posted would still lead to some people losing. There is no free lunch. And surely it’s never about renters vs owners. It’s people vs people. Maybe I’m daft, but who loses if the city helps with ADU / DADU conversions for low income? Who loses if multifamily upzoning can occur when adjacent neighbors agree to it? Both ideas give control to impacted owners while also providing more housing. Some proposals like the golf course idea have losers like the people in gated communities, but the key is they are only losing exclusive use of their golf course, not some undo burden like seeing their neighborhood bulldozed. The idea is to address all reasonable concerns, not every possible concern. TJ – sorry, i meant “tj” — thinks that all should have prizes. In the Socialist utopia, no one wants for anything. I am sure as you think through the ideas, you’ve realized how all ideas have losers. Just that you either think the lose is acceptable. ADU and DADU idea is the same as all other density increasing ideas with the same winners and losers, just that its impact is tiny in terms of gains and loses. There is no solution that’s great for all, just how we want to trade off. People with less rather than more money who want a a chance at making a home somewhere when adjacent neighbors don’t agree to it. The proposal is in addition to HALA, not in place of it. So in other words you are arguing against more housing if you oppose that proposal. The idea is to allow new upzones provided that adjacent neighbors agree. I support the upzone part. Just not the “nieghbors must agree” part: upzone any parcel if someone asks for it to be upzoned. I’m fine with a courtesy notice to the adjacent neighbors. Saying we should throw out zoning and land use requirements entirely and let the free market decide is sort of the flip side of saying we should make no changes to land use codes at all. Win-win means looking for ways to increase housing supply while addressing the reasonable concerns residents have and that the land use code was designed to address. The piece of the land use code we are talking about was designed to prevent apartments and cottages from being built near where people with more money and political power. I don’t think of that as a reasonable concern. Yes, and we should all leave so American Indians can rightfully take back the land from us. Current land use codes here were established in the 1990s as part of neighborhood planning. Regardless, talking about land use origins misses the point. The point is that residents have valid concerns if land use is entirely tossed and their neighborhood is turned over to the highest bidder without any limits on buildings. In that scenario you have entire neighborhoods bulldozed in a developer feeding frenzy and everyone leaves or ends up like Edith Macefield. If that’s your goal- to demolish neighborhoods in order to make way for density, why not target places that have low walk scores and lower density but are just as conveniently located, like Broadmoor? Displacement will be far less of an issue and those are the places that are objectively “worse” on an urbanist scale. Targeting urban villages with high walk scores for demolition maximizes displacement and disruption. If creating whole new neighborhoods is your goal, then look to create new urban villages in the places that have the worst housing arrangements, don’t look to destroy the places that are closest to what you want already. I definitely want to upzone Broadmoor! If our neighborhood is upzoned I can 100% guarantee it won’t be bulldozed in its entirety for quite some time because we don’t plan to sell our house. Yeah, but HALA doesn’t touch broadmoor or any other car centric neighborhoods. It creates zero new urban villages, leaving all car centric neighborhoods frozen in amber. That’s the key problem, not the few places like Wallingford that already have higher density. In terms of staying put, most people don’t want to live in the middle of a construction zone for years and then have cement walls towering over them on all sides when all is said and done. Would you be happy going through what Edith Macefield went through? Most aren’t, and very few people and homes remain in Ballard that were there 20 years ago. The key issue with upzones isn’t multifamily, it’s fear of rapid teardowns destroying a neighborhood. 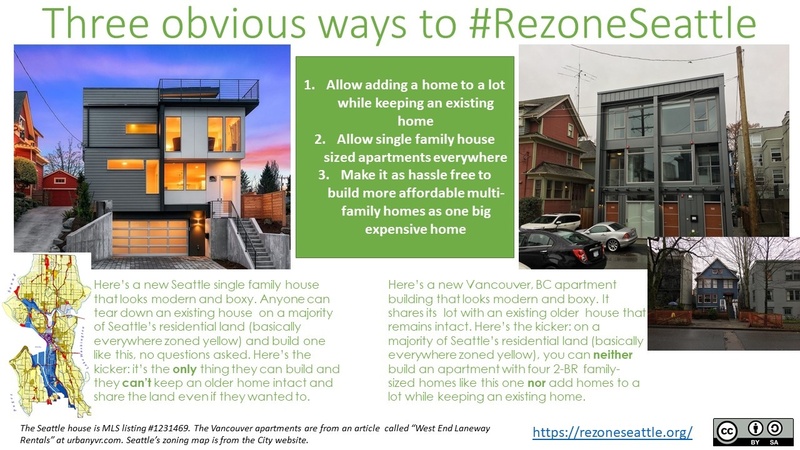 I think capping demolitions per year would make a lot more people happy with a multifamily rezone. Wouldn’t you agree upzoning Wallingford makes much more sense than upzoning Broadmoor in terms of location? Wallingford has way better access to more key locations around the city already. Let’s support upzoning both areas, but more so in Wallingford. Most people don’t want to live in the middle of a construction zone for years, but is that reasonable concern? I personally don’t think so. Teardown & rebuild 2 houses down. Gut job next door 2016-2017. Gut job on the other side next door 2017-present. Lots of construction in the hood, all within single family zoning (and all for single family detached homes). Yeah, absolutely Bryan. Virtually every tear down should be resulting in a multifamily dwelling city-wide, not just urban villages. I agree and many so-called “NIMBYs” agree with that. What pro-HALA folks are ignoring is that demolishing urban villages in a whole sale sweep of existing housing like what happened in Ballard is not a good idea. It destroys neighborhoods, it’s terrible for the environment, displacement impacts are highest in urban villages, it generates resident opposition, and new housing typically costs double on a square footage basis compared to existing housing. Urbanists need to start thinking more in terms of achieving their goals in the context of reduce, reuse, recycle and less in terms of what’s good for developers is good for everyone. For instance, we made space to rent out our basement after putting in a backyard office. No losers there, just winners. I’m very much with you on this concept. I even blogged about it: allow folks to split their lot and enable them (or whoever they sell it to) to build on it; I think incentives to keep the existing structure intact would probably be fine. Nice Bryan! One thing our family learned was that it’s a lot tougher to add a DADU than an ADU. Adding an ADU for us just required adding a back yard office and a kitchenette downstairs, which was a total of only 15K and had no negative impacts on neighbors (I did most of the labor on both of them myself). Plugging in an DADU starts at like 10 times that amount since it requires architects and land use permits and separate heat / plumbing / electrical. Even adding a tiny home or airstream requires a lot of that. Anyhow, I think there’s middle ground, but it won’t be found by the developers that paid Murray and Johnson for the gift wrapped package that is HALA. Hopefully Durkan is less corrupt than Johnson and Murray and will actually include the people impacted by land use changes when making decisions. Define “reasonable concern”. I can define that as concerns for the society as a whole. Individual-based concerns aren’t reasonable. We can move that line to pretend all the losers are just being unreasonable, therefore not deserved to “win” anything. The number one problem is that people will not agree, and your win-win is only in your mind instead of agreed to be win-win by others. This debate could benefit from some realistic and accessible forecasts of how different zoning changes would change the neighborhood, both positively and negatively. I can’t tell if there is a version of zoning changes which will lead a young tech workers like Zach being able to live in Seattle. I can’t tell if affordable rents for lower income people is even possible at any realistic level of change. I also can’t tell how such changes would affect the Wallingford; what will change, where and how fast? Will local business thrive or struggle more? Will it become more diverse in race and age and income? Will the neighborhood become more walkable? Will ratio of dogs to kids in Wallingford park change? There are no shortage of predictions, usually extreme in some direction but almost never backed up with data. Right, data! for example it’s accepted as gospel “in Lubarsky’s view” that when there’s a sudden influx of thousands of high paid new employees, the inevitable skyrocketing housing market is because “we’ve underbuilt”, and even though the next year, we manage to build twice as much, still the reason we “underbuild” is because zoning! That could use some back-up from Mr. Data Miner. How could it be zoning – year after record-setting year? Think about it. But there will always be a seat at the table, downtown, for guys like Lubarsky, and Phelps-Goodman and maybe even some of our local hard-working market urbanists, because that kind of “unleash the market”, “the market needs less regulation” answer brings a smile to the faces of developers everywhere. They’re still going to “underbuild” unless they’re super confident in the market down the road – they’re not insane – but they can always use more profits. And a “data miner” – to swoon over! 1. Because the zoning hasn’t changed. 2. And you can just look at the ratio of homes to jobs and income to know that the # of homes built isn’t enough to hold it constant at what it was in the past. Hah, apparently you get it, but you don’t get that you got it. If the zoning hasn’t changed, and it’s the constraint that causes underbuilding, then the building will decline every year. In reality, it hasn’t been declining, it has been more like doubling. Nothing can cause housing to be built in time to be available for surges like we’ve been seeing. The developers aren’t going to look up and see that we have 5,000 new techies hired on, and say “thank heavens there’s no zoning, we’ll just snap our fingers and there’ll be housing waiting for them!” The MHA upzones, assuming they happen, aren’t going to change the dynamic one bit. Building will lag the housing market, there’s nothing you can do about it, unless you’re wililng to intervene by building those bro barracks under government sponsorship. Don, as you’re aware, when the city increases in population there will an increase in housing built. There is still some “available capacity”. 1. Will there be enough built? 2. What is the annualized cost increase? 3. How much displacement will there be because we constrain the places where development can happen? Post MHA, I guarantee you the same answers. It will look more like Ballard, but it 1) won’t be enough, unless population trend reverses, and therefore 2) it will be expensive and 3) if you have middle class or fixed income neighbors, they’ll be heading for the hills. Changing zoning does not address the problem. Your assertion, Don, does of course contravene history, economics, and lived city planning. Building more housing rather less keeps prices more moderate. Moderating housing prices helps keep middle income people in their homes. Building less housing (your position) absolutely guarantees that housing prices will continue to skyrocket, benefiting only homeowners such as yourself. My position doesn’t have anything to do with building housing, nor does yours. Zoning is not building, and it hasn’t provided and won’t provide the control over building that you’d need to avoid surge spikes. Development boosters take advantage of the suffering to relax regulations, but the promise that it will make a big difference is fraudulent. I think we can agree that your position, Don, has nothing to do with building, as you want none of it. Additional housing of the scale we need of course requires zoning reform. The only people benefiting today by our status quo are the wealthy property owners such as yourself. The real fraud is the one perpetuated by you as an officer of the Wallingford Community Council: that we can address the housing affordability crisis by maintaining our single-family neighborhood as sacrosanct. If majority of the Ballard-Fremont-Wallingford-University area are like Ballard downtown area, housing would be cheap, and somebody on a school teacher salary would be able to afford the area again. If the whole of San Francisco is built like Paris, real estate there would be cheap also. Ballard and Wallingford provide a great comparison. 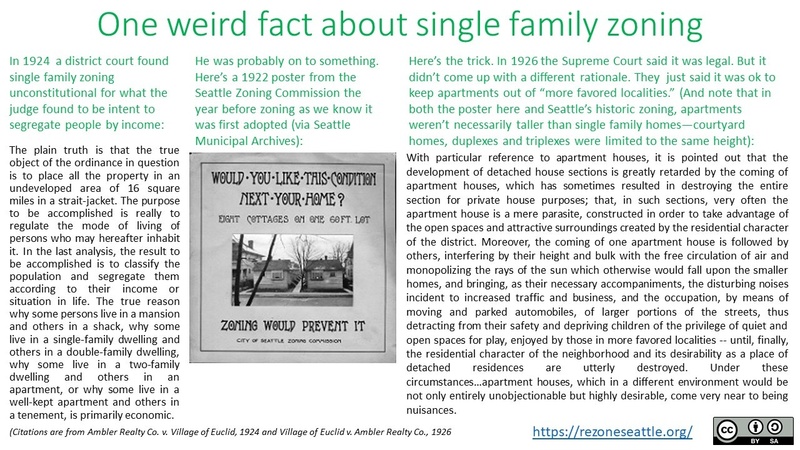 Eric’s right that central Ballard’s zoning (and subsequently the buildings) have changed. 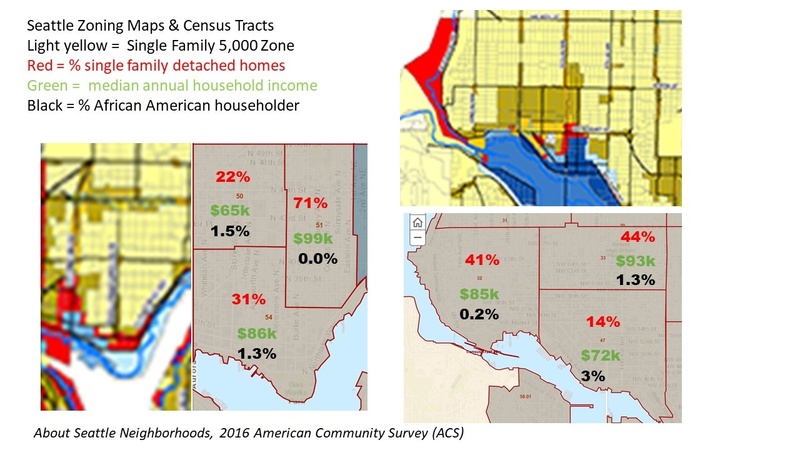 Here’s a comparison of what happened to the human population in central Ballard versus the eastern almost all single-family zoned part of Wallingford where neither the zoning nor most buildings have changed between 2000 and 2016. 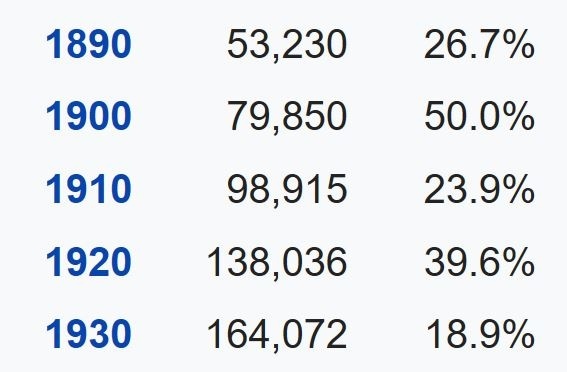 That part of Ballard provided homes for a lot more people, income rose from below to about the Seattle median, the population got a but younger, and kept its racial diversity. That part of Wallingford provided homes for almost no new people, and got older, much richer, and whiter. That’s pretty much the choice to be made. Just allow *plexes to compete with single family homes and we’ll get more homes of more affordable types built by a totally different set of folks than those building towers. Housing can be built in time to be available for surges if the laws are changed. For example, to have codes encouraging old houses to be knocked down. Tokyo housing price has been very stable for a long time now, even with huge influx of people, since they build up so fast and knock down old buildings for new ones all the time due to favorable policies. And no they don’t just build towers. A lot of buildings are also small multi-family units. What is the most sad to me here is how gleeful former Wallingford Community Council President Carl Slater is in having blocked housing in the 1970s, in downzoning the neighborhood, and how much the present Wallingford Community Council is perpetuating this heritage of opposition to housing affordability.